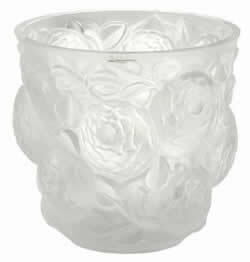 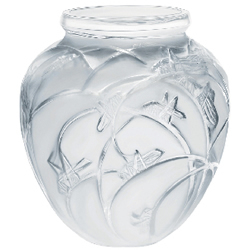 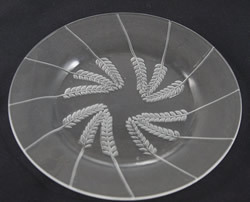 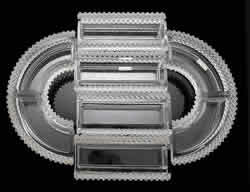 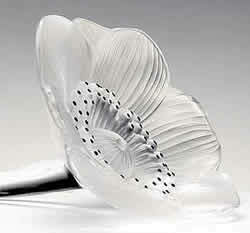 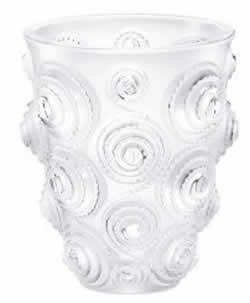 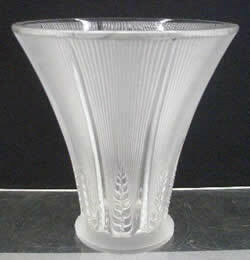 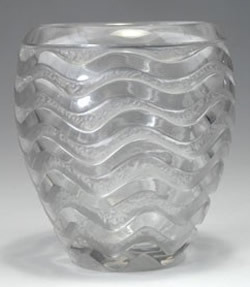 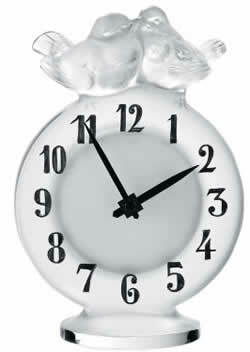 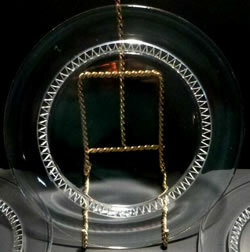 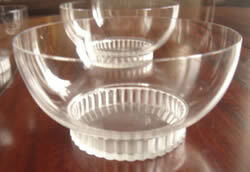 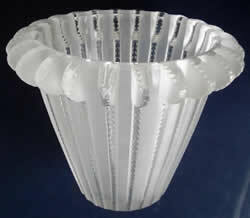 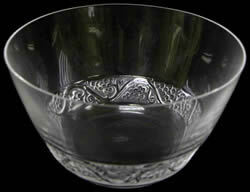 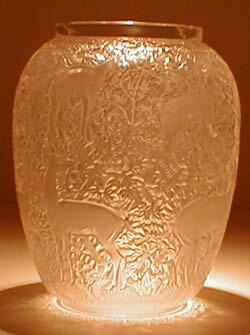 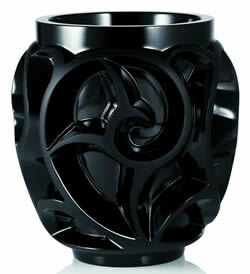 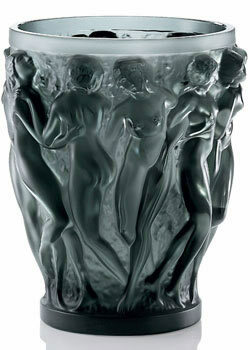 After the death of Rene Lalique in 1945, his famous Lalique glass was no longer made. 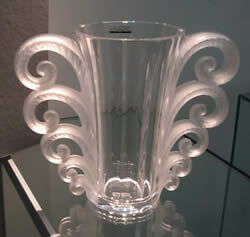 His son Marc Lalique, who had been active in his father's business, set out on his own path. 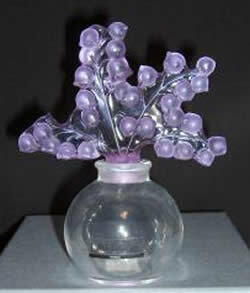 He made objects using crystal, his preferred medium. 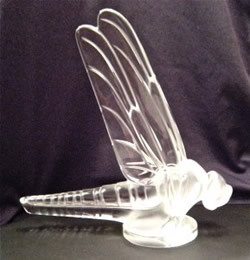 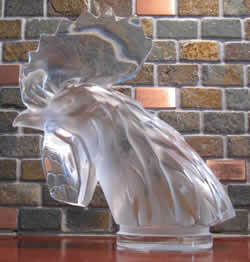 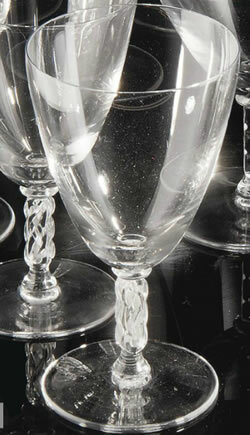 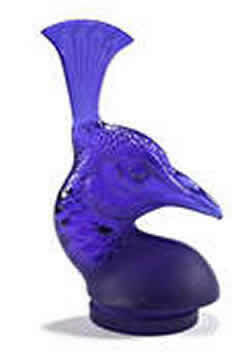 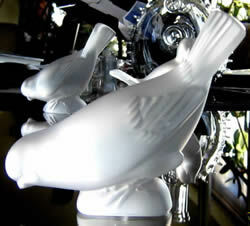 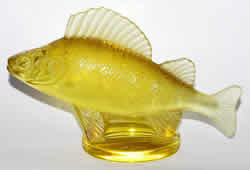 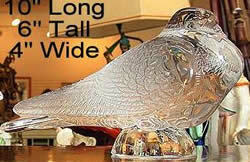 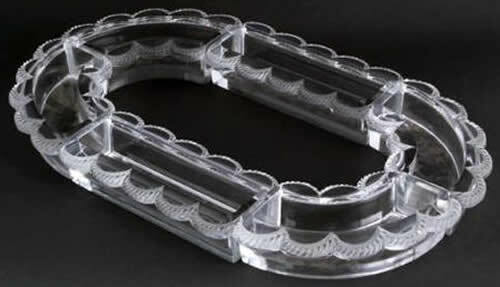 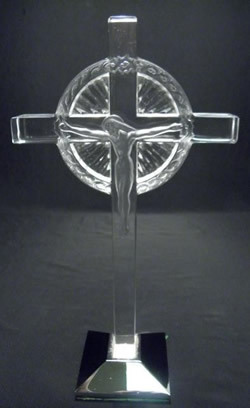 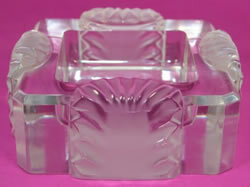 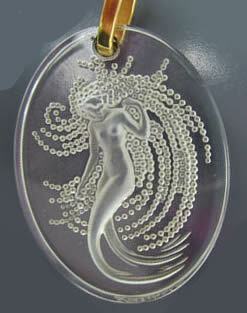 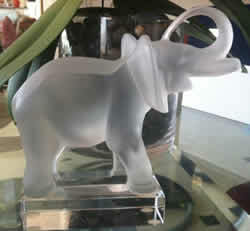 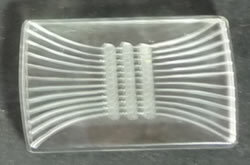 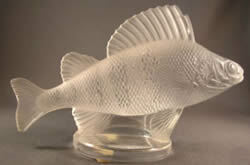 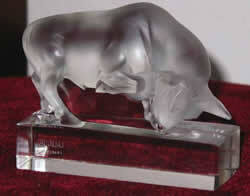 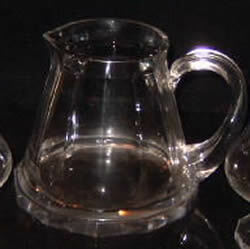 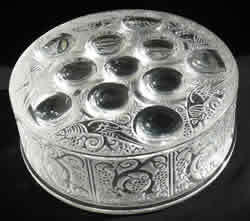 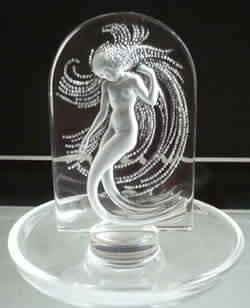 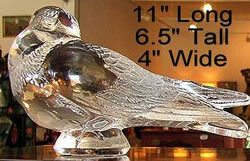 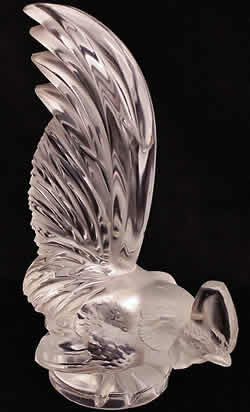 He marketed these objects under the name Cristal Lalique. 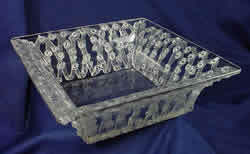 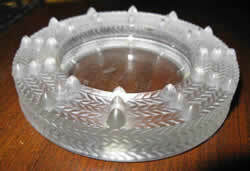 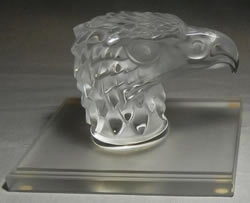 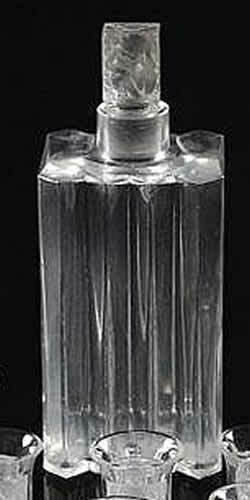 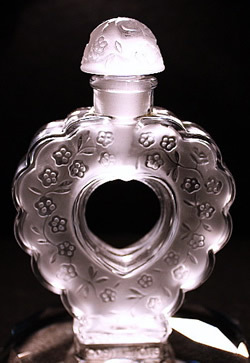 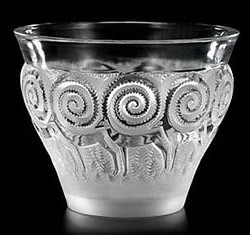 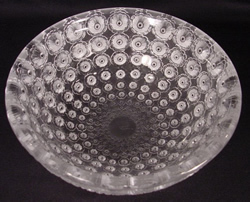 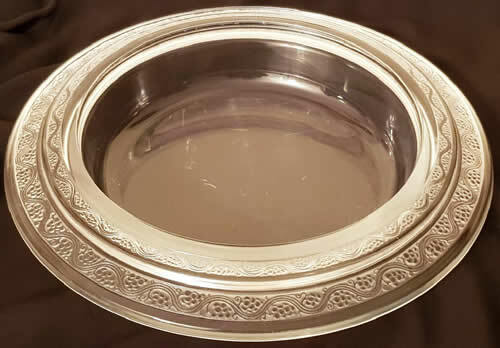 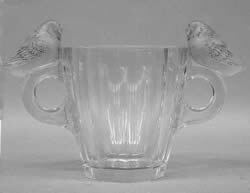 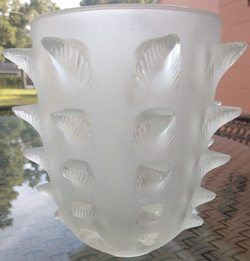 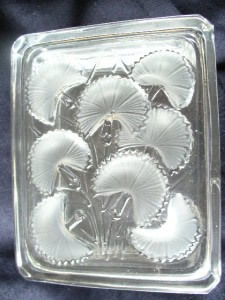 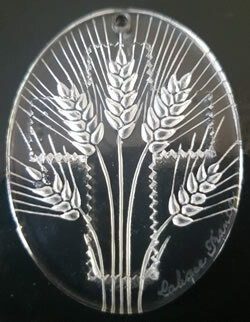 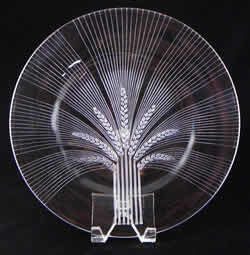 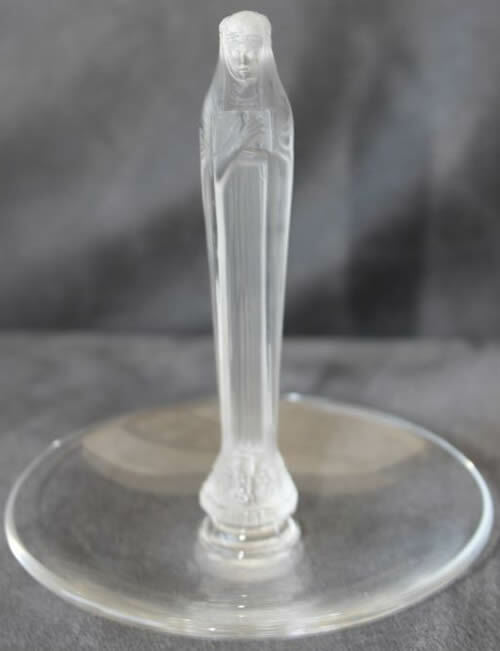 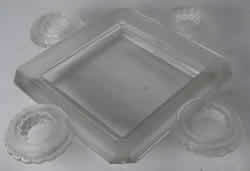 Some of the items designed by Rene Lalique were still sold for a period of time after the war, but they too were made in crystal and marketed as Cristal Lalique. 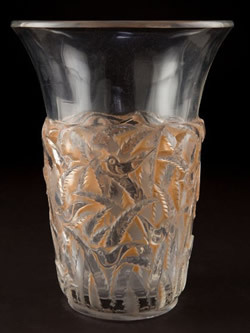 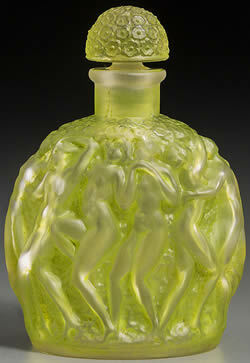 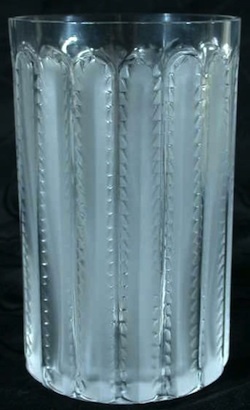 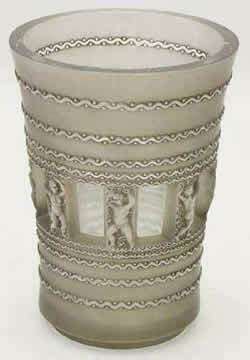 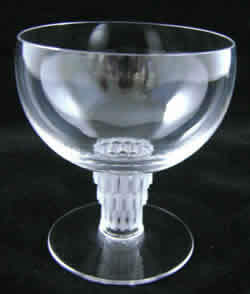 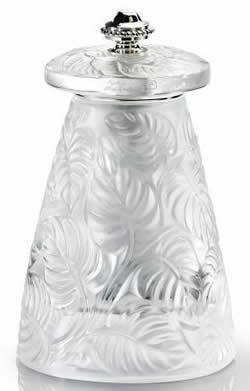 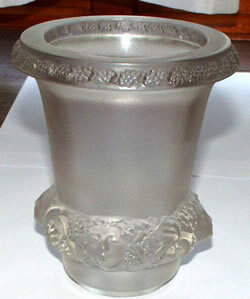 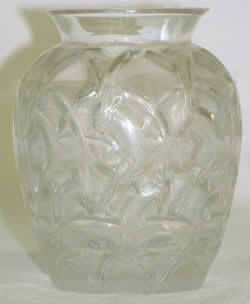 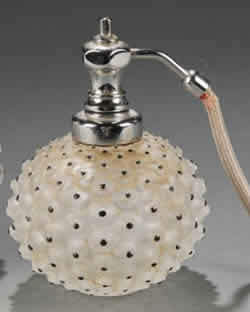 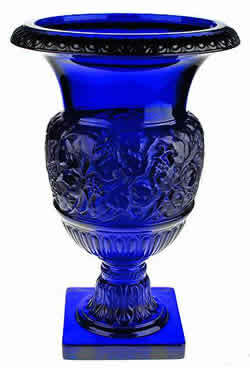 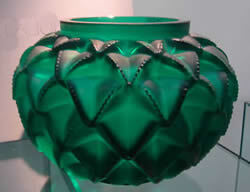 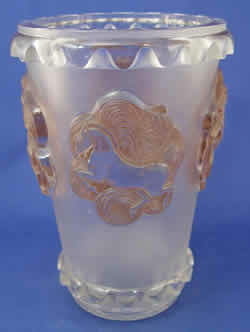 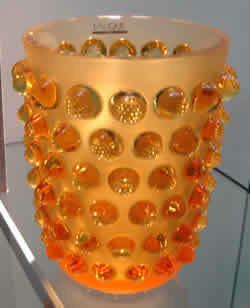 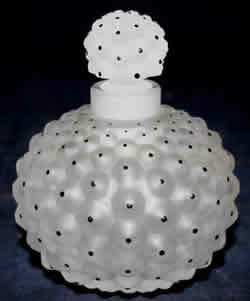 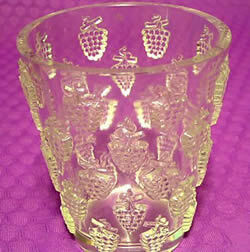 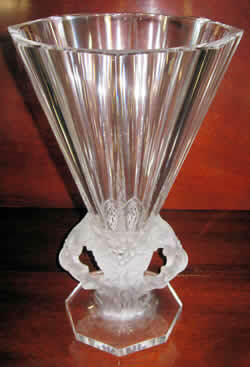 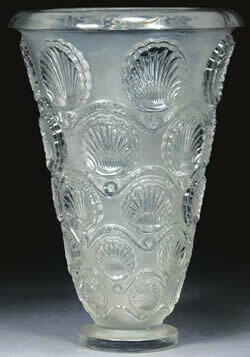 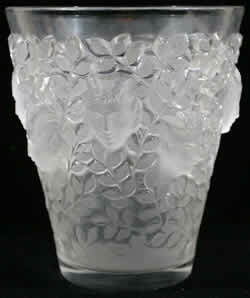 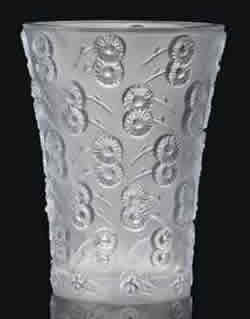 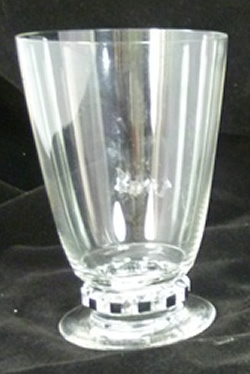 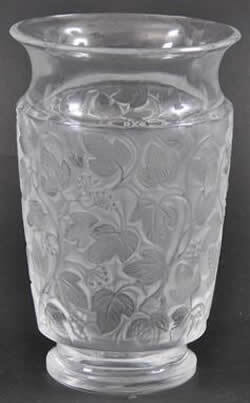 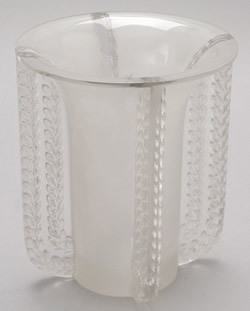 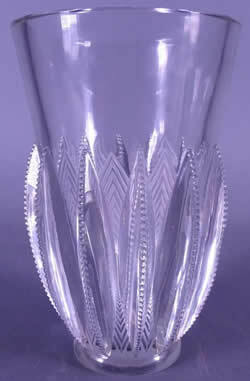 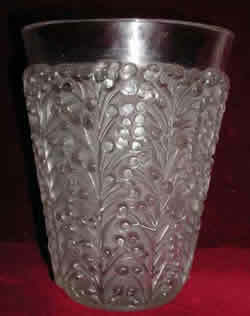 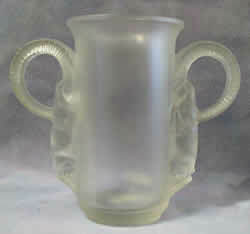 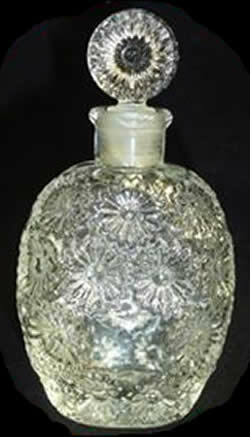 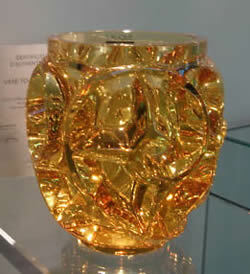 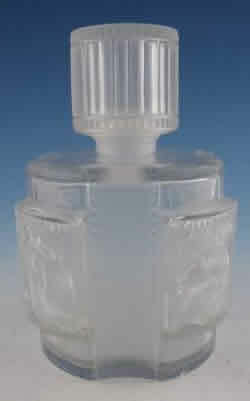 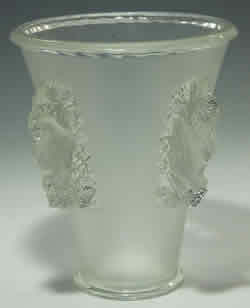 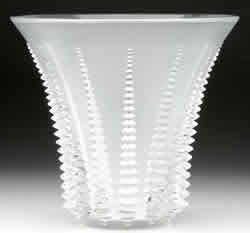 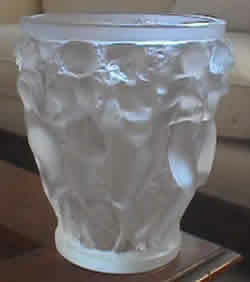 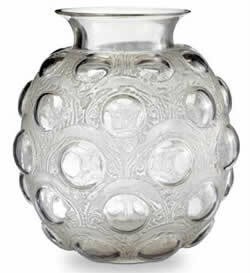 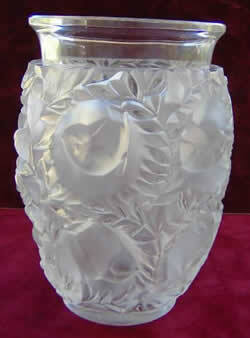 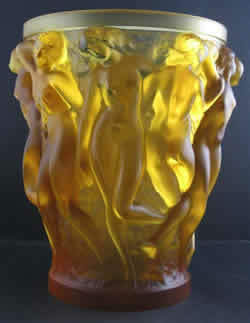 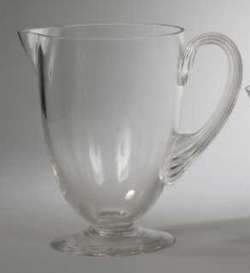 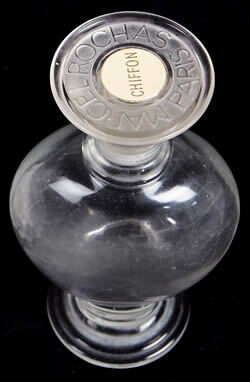 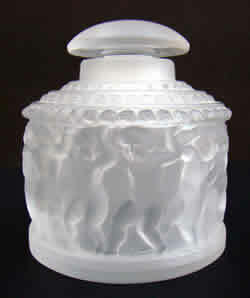 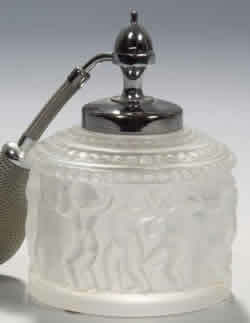 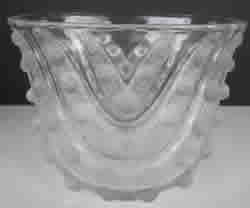 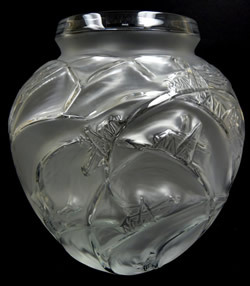 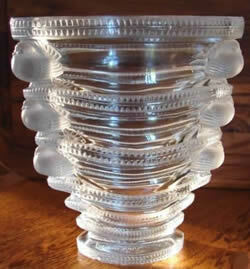 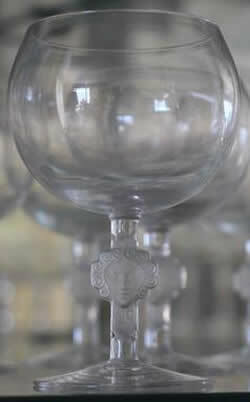 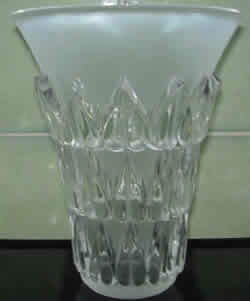 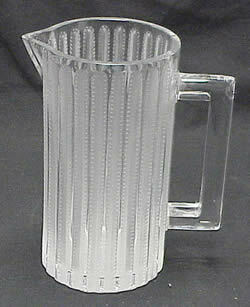 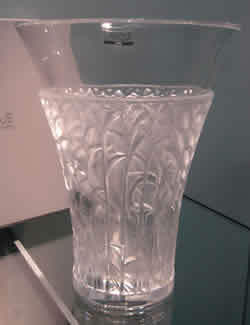 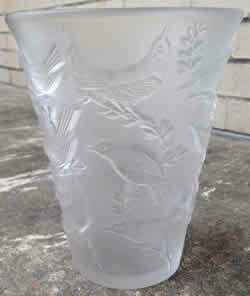 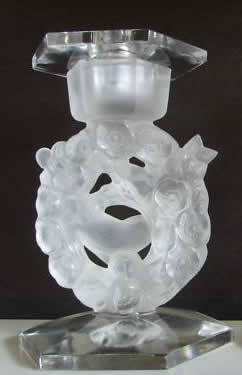 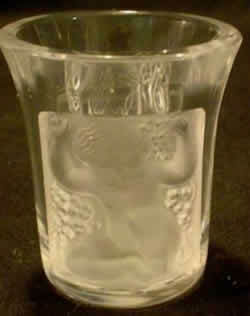 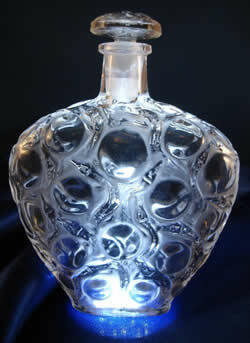 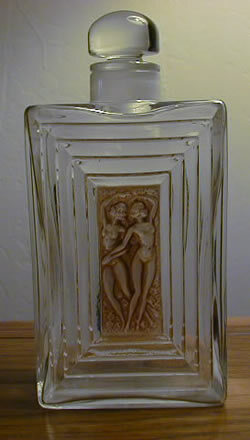 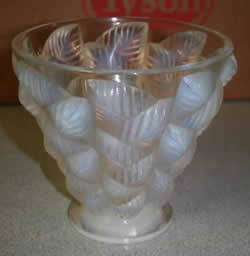 A few pre-war designs are still sold to this day, made of crystal, such as the iconic Bacchantes Vase. 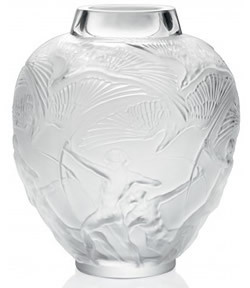 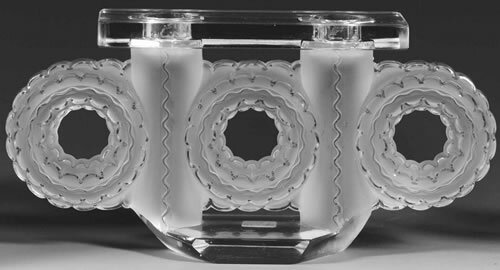 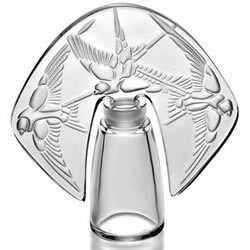 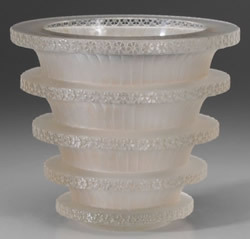 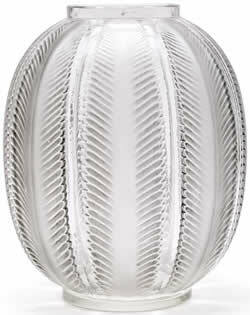 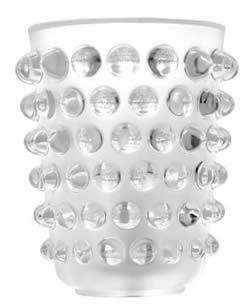 And it appears that in the period 2009-2010 the modern Lalique company increased the number of Rene Lalique designs that are being reproduced in crystal. 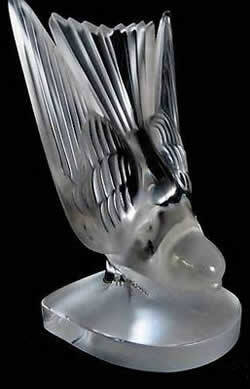 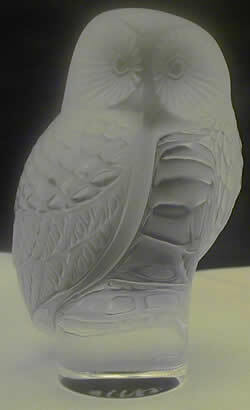 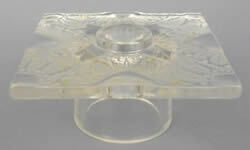 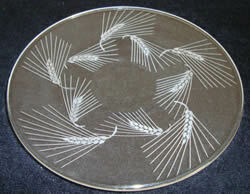 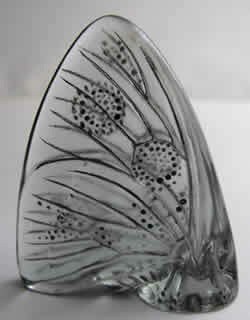 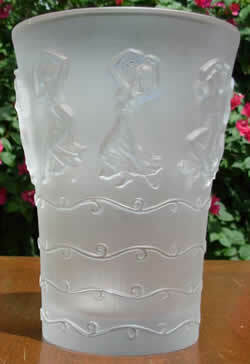 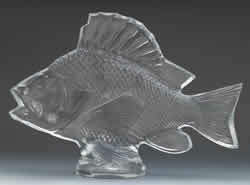 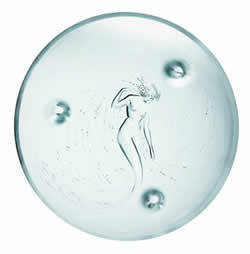 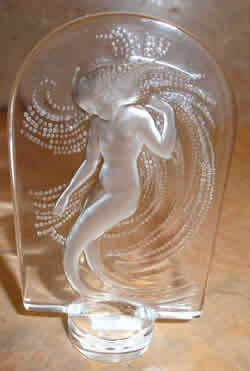 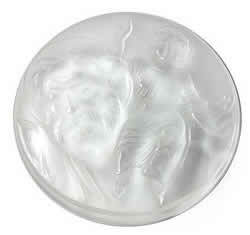 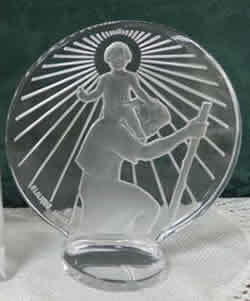 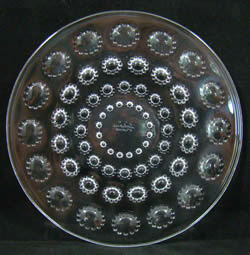 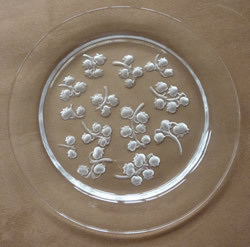 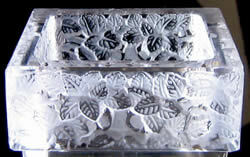 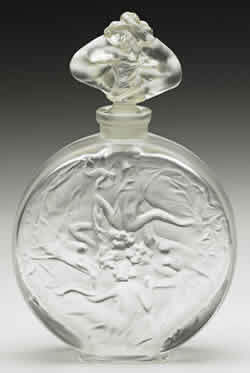 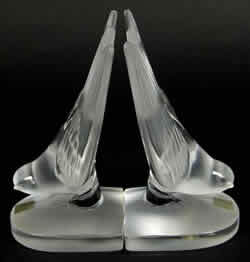 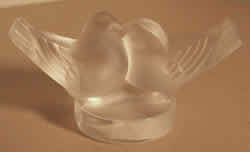 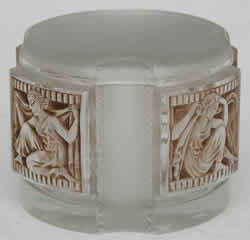 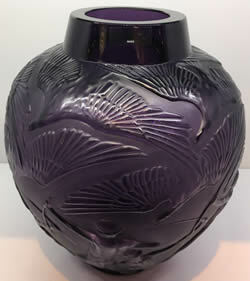 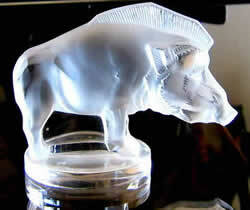 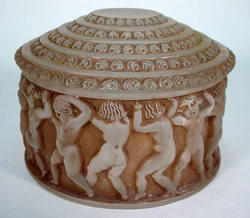 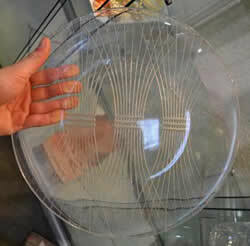 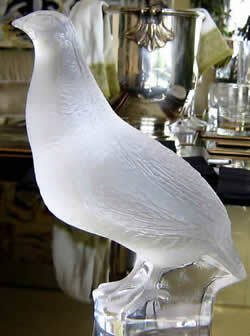 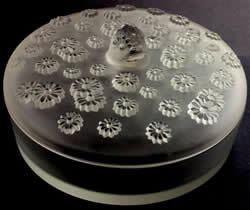 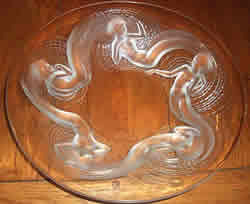 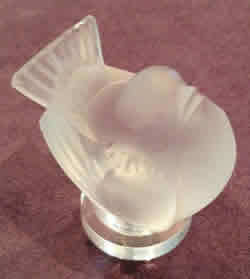 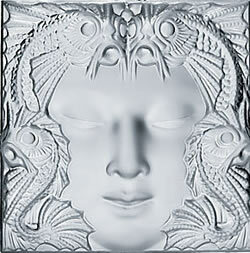 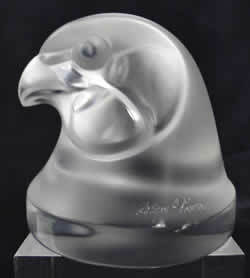 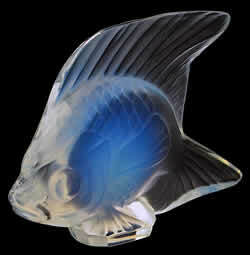 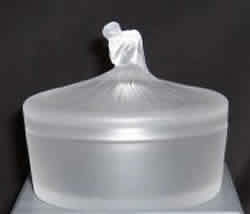 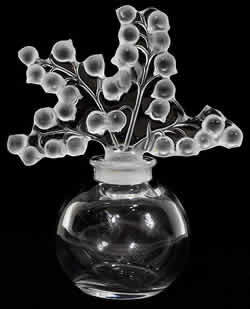 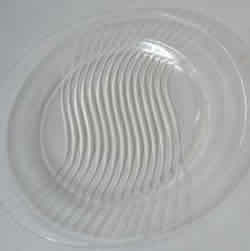 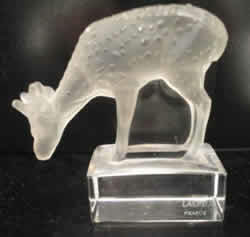 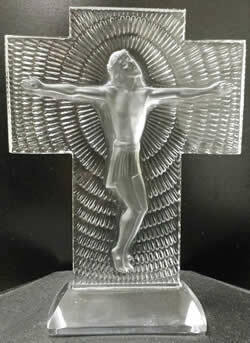 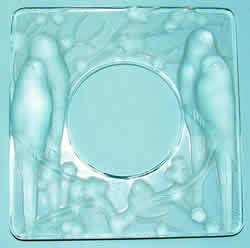 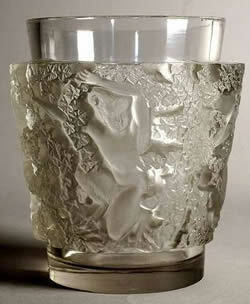 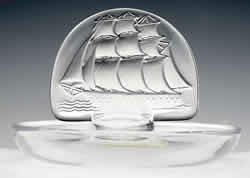 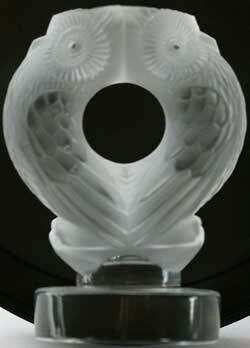 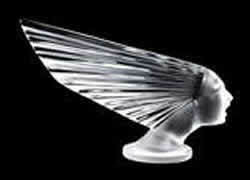 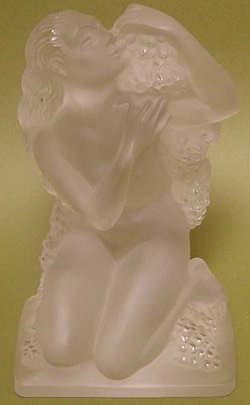 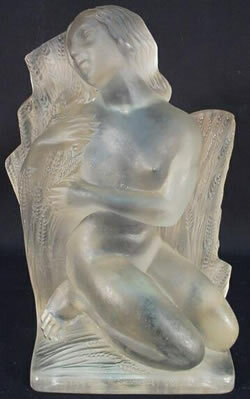 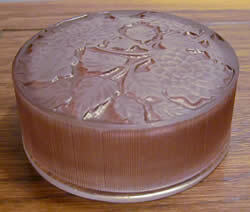 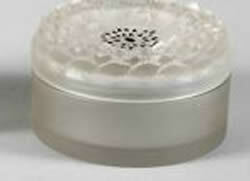 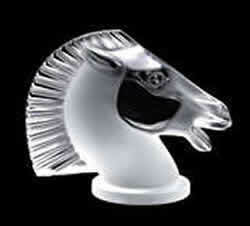 More information about modern reproductions can be found in the Rene Lalique Biography section on Lalique Crystal. 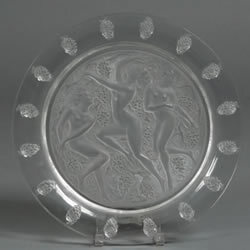 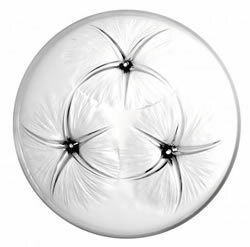 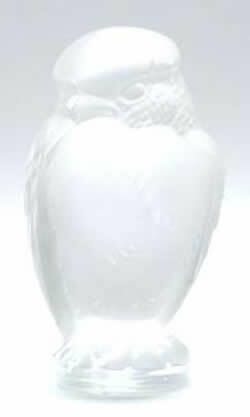 And you can find a discussion of the signatures on the modern Lalique crystal pieces at our page on modern Lalique France Signatures. 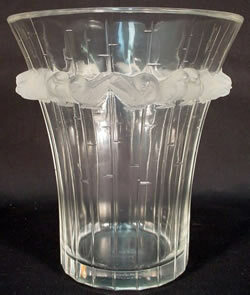 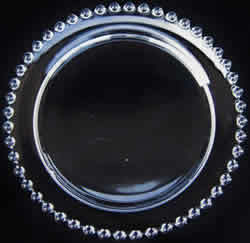 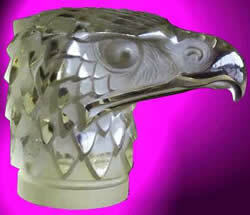 These post war crystal reproductions of RLalique designs have created a bit of an opening for fraud. 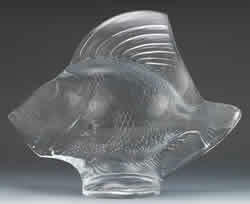 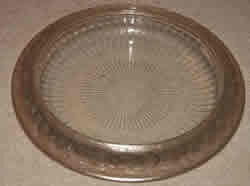 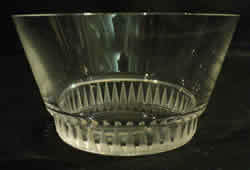 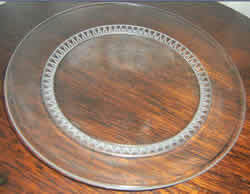 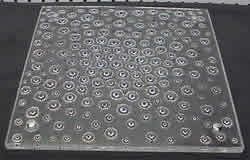 As they are generally (and usually substantially) less valuable than comparable RLalique glass items, unscrupulous individuals can and do alter the signatures of later pieces to indicate that they are RLalique, pre-war items, when in fact, they are crystal pieces made after World War II, and are not RLalique glass items produced by Rene Lalique. 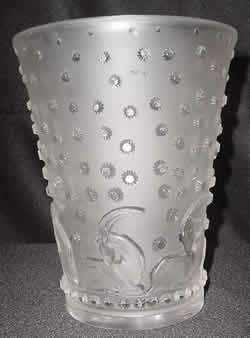 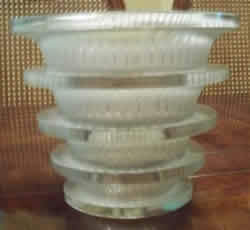 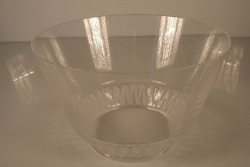 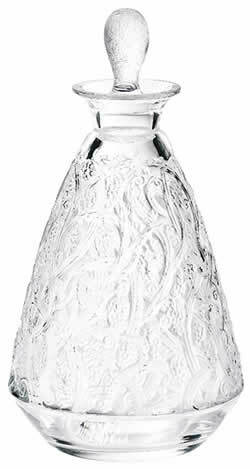 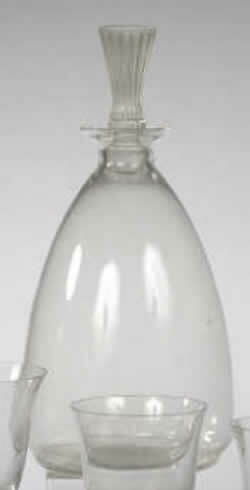 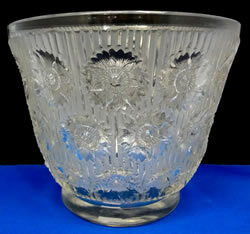 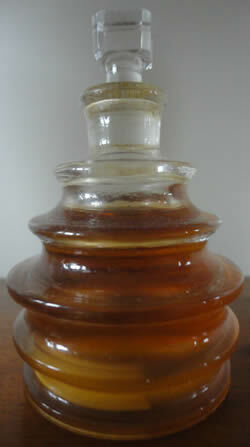 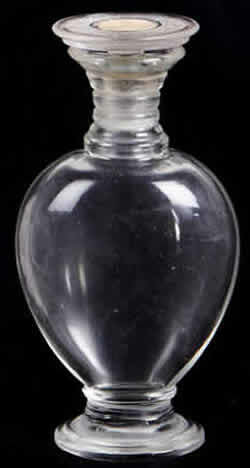 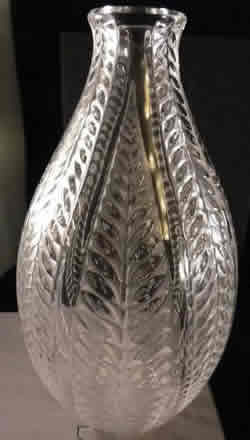 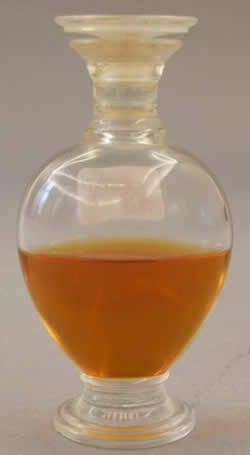 For example, a modern crystal Bacchantes Vase might be found on Ebay in great condition for two to three thousand dollars. 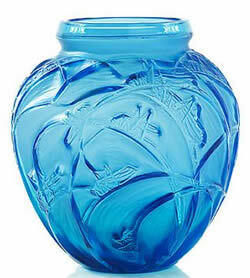 But with a new signature and patina, this vase can be sold for $10,000 to $20,000 if represented as RLalique to an unsuspecting buyer. 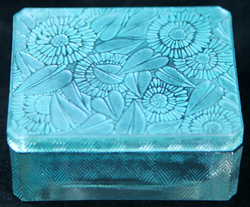 Patinas are also sometimes added to crystal pieces along with the forged signature to make the case even more convincing. 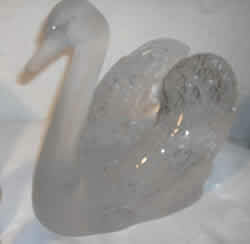 So some care must be taken when acquiring an RLalique item that was also made in crystal after the war. 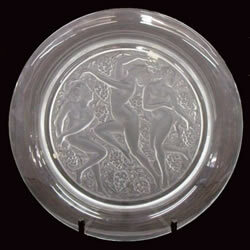 Following are photos of models where the modern Lalique Company has reproduced R. Lalique designs after the death of Rene Lalique. 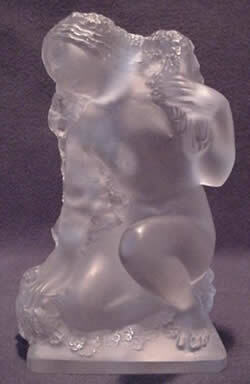 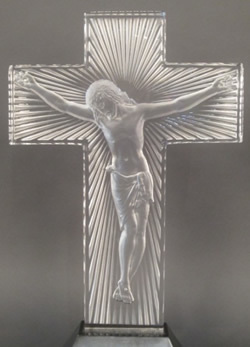 The photos are all of modern crystal reproductions. 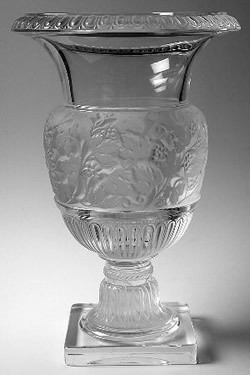 This photo gallery is not complete, and there are other post war cristal items not pictured that may also present a problem. 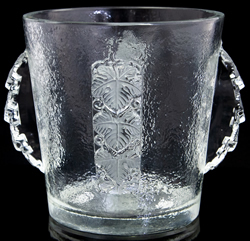 If you have one of the designs which was produced after WWII that has an RLalique signature, or if you are considering acquiring one of these models with an RLalique signature, care should be taken to properly authenticate the item as RLalique glass. 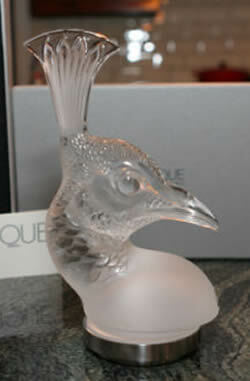 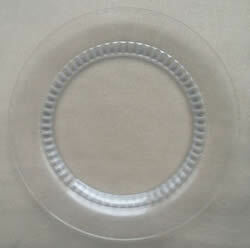 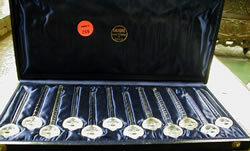 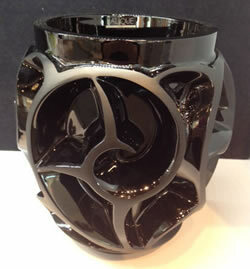 See our Rene Lalique Identification and Authentication Services if you have concerns. 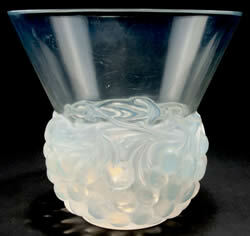 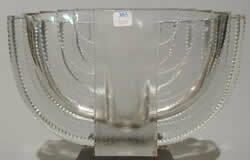 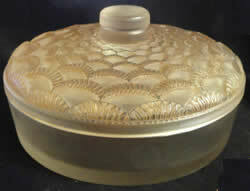 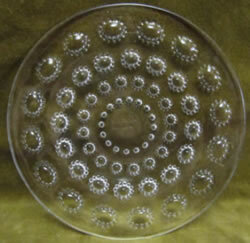 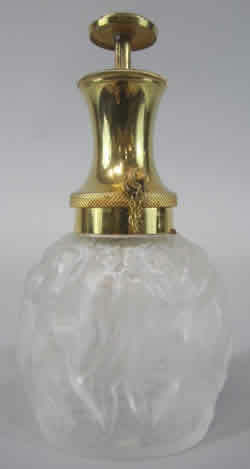 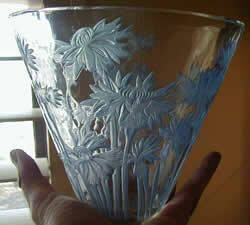 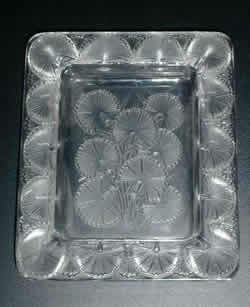 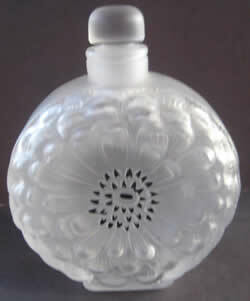 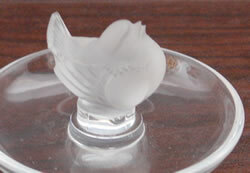 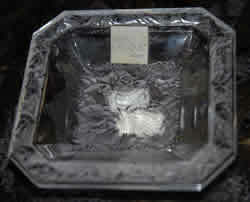 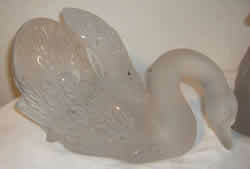 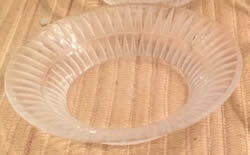 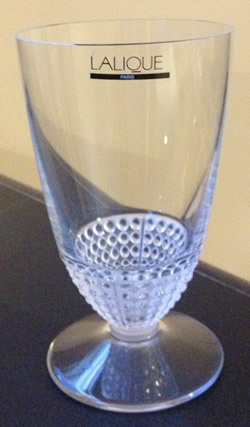 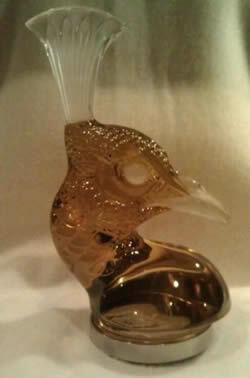 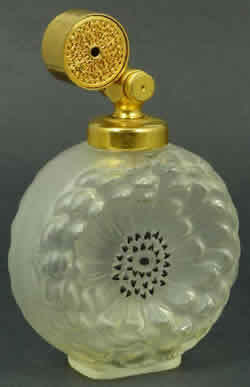 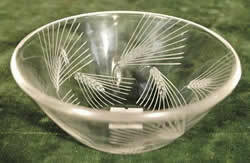 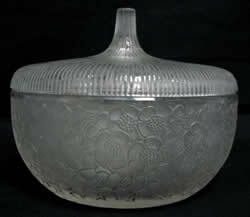 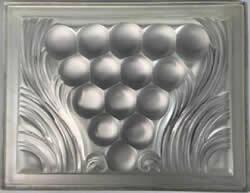 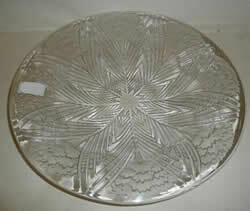 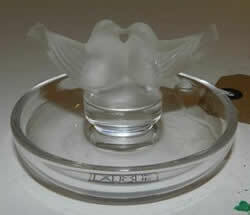 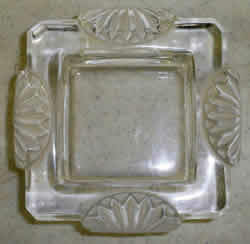 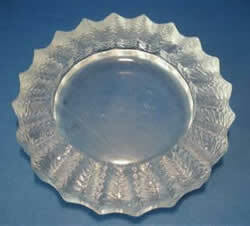 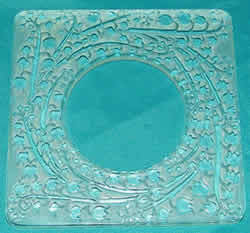 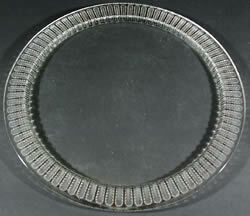 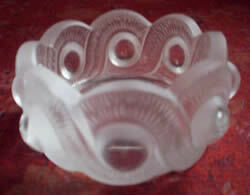 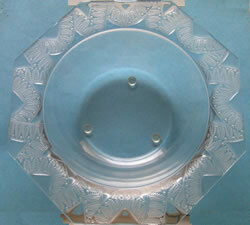 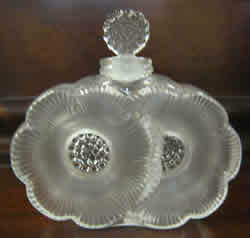 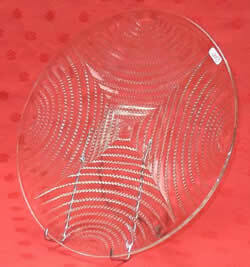 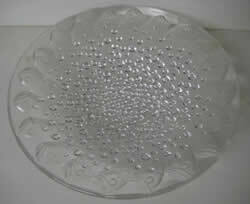 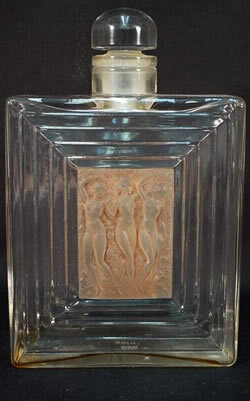 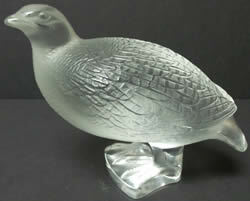 We have also show here a of photo of an early post war signature on a reproduction of an R. Lalique design. 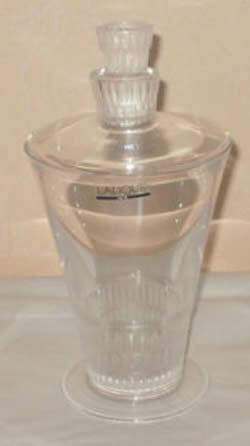 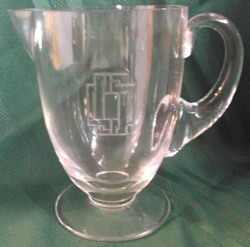 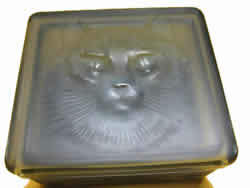 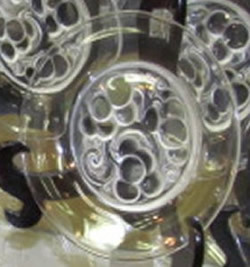 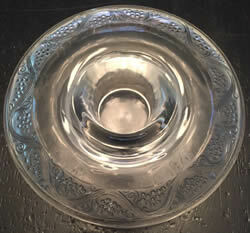 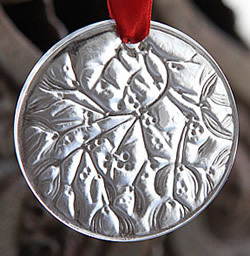 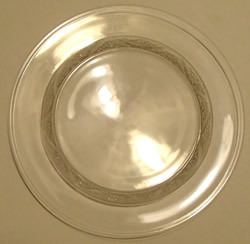 Notice the block letter acid (or sandblasted) etched stencil signature, where it appears that nothing more was done than to drop the R from the original stencil, leaving the word France un-centered beneath the word Lalique. 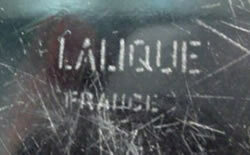 This is quite typical of how some early post-war reproductions were signed, making it a somewhat simple matter for the unscrupulous forger to "restore" the RLalique signature. 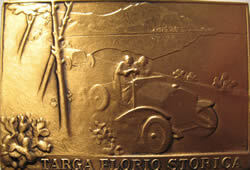 Finally, when looking at these photos, ignore the color of the model shown, and the color of the applied patina, as the patina can be any color. 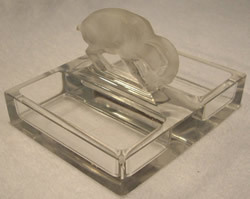 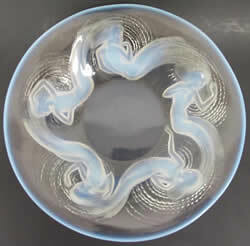 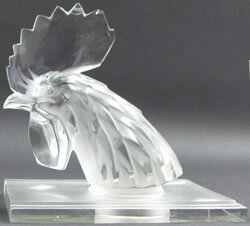 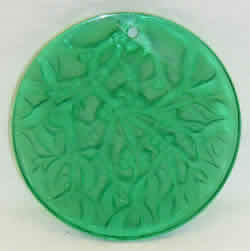 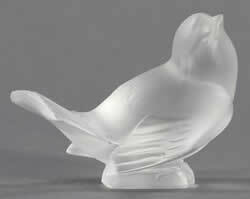 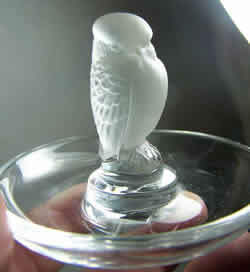 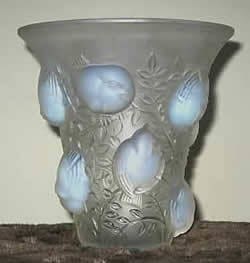 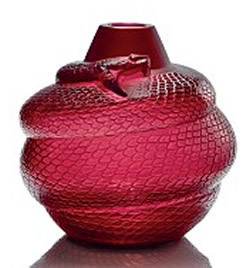 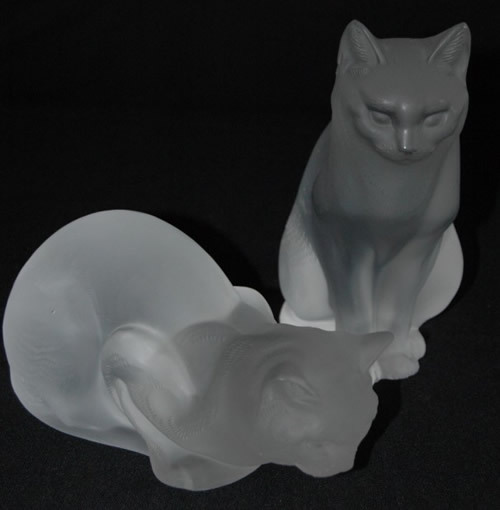 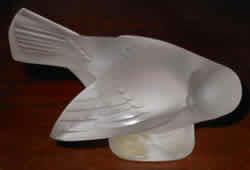 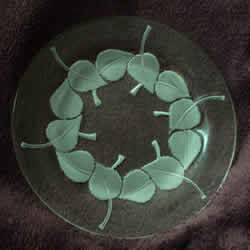 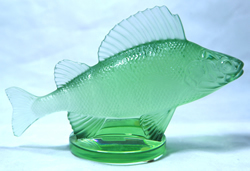 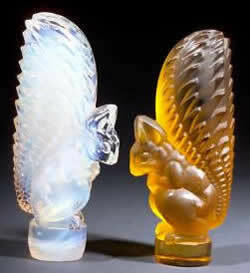 Also, especially for small items like the squirrel paperweight, it was later made in many colors, so the color pictured here can also be ignored, and care should be taken in acquiring any color of this (and other) designs which were produced in cristal after the war, when signed RLalique. 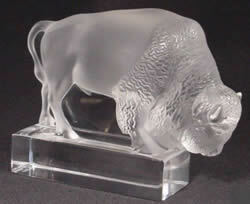 Even in these circumstances, it is important to remember that the signature does not authenticate the item. 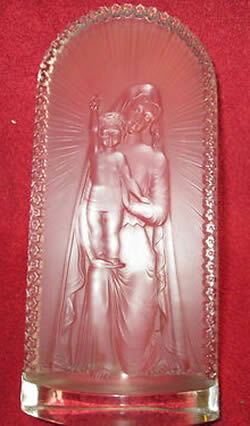 In fact the reverse is true; the item authenticates the signature. 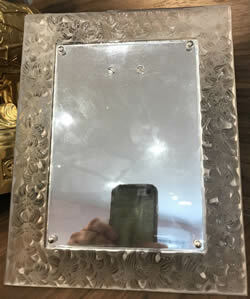 Also ignore the apparent size in the photo, as they are not in proportion to each other so some pieces are larger in real life than it might seem from the photos, and others are smaller. 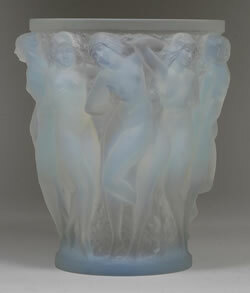 R.Lalique Vases known to have been reproduced not pictured here: Quarante Roses, Cactus, and Jaffa. 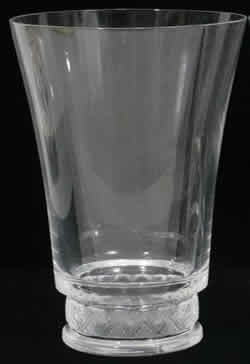 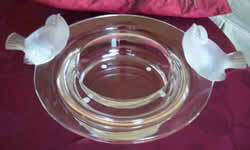 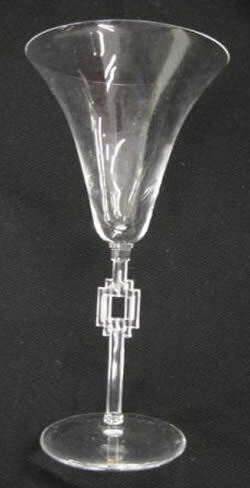 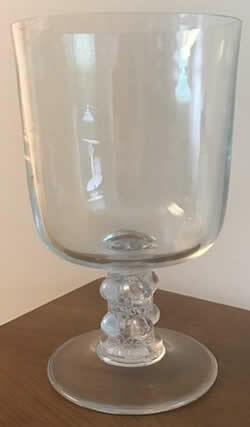 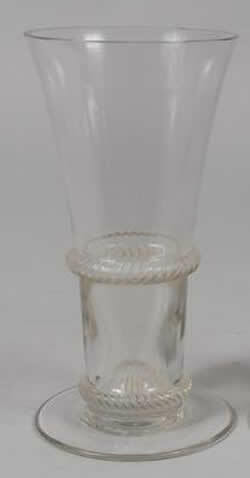 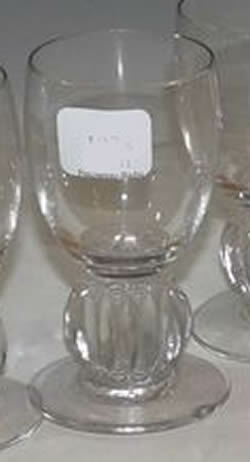 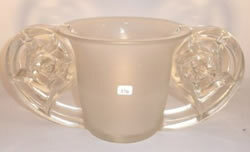 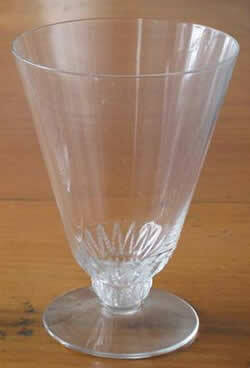 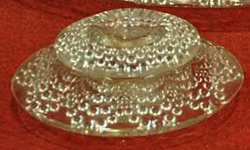 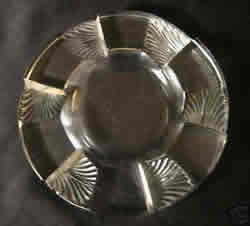 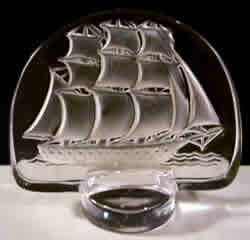 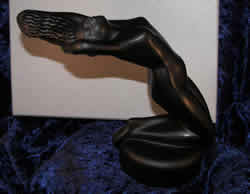 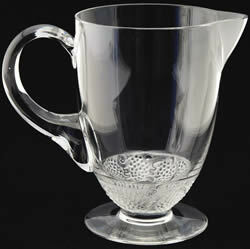 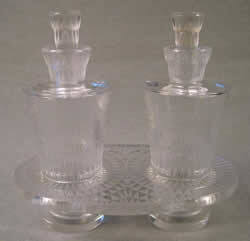 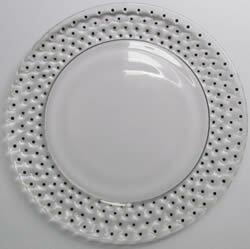 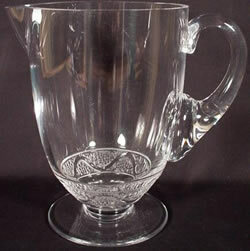 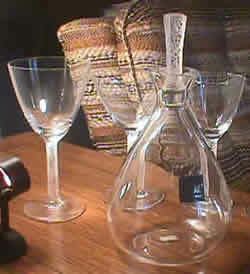 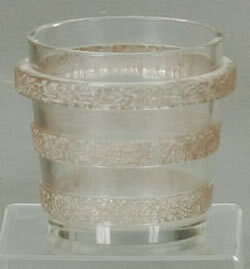 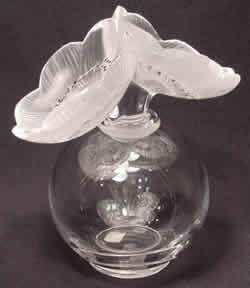 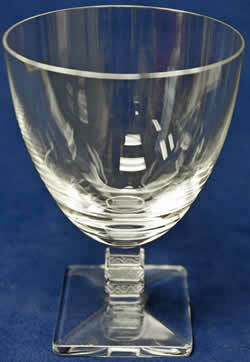 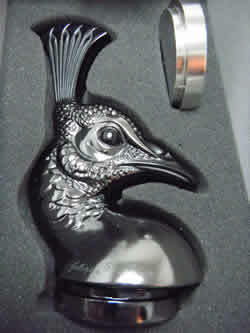 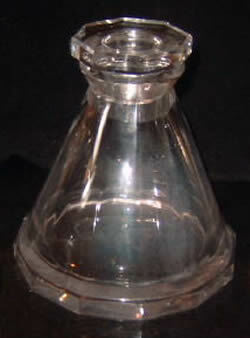 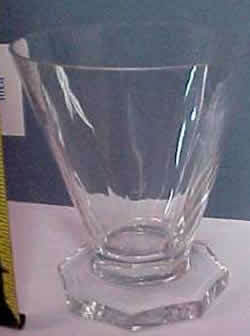 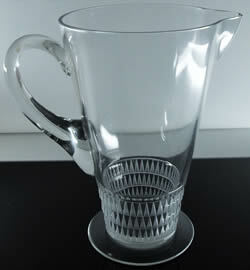 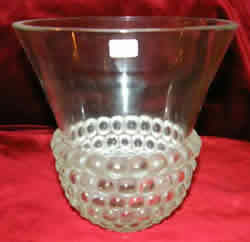 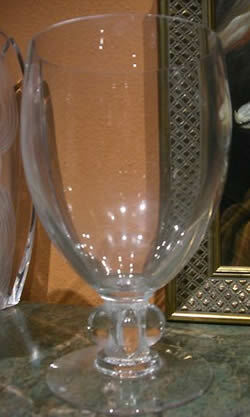 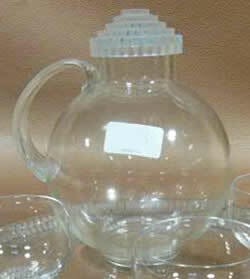 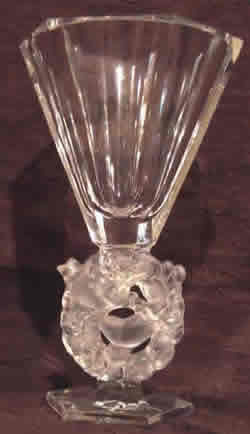 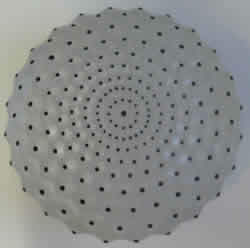 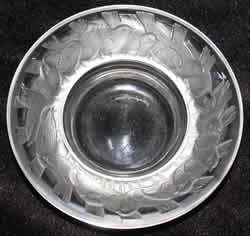 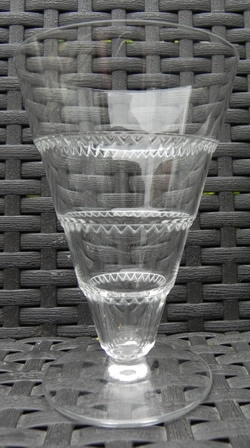 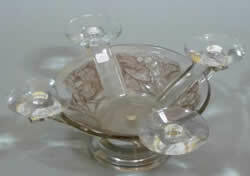 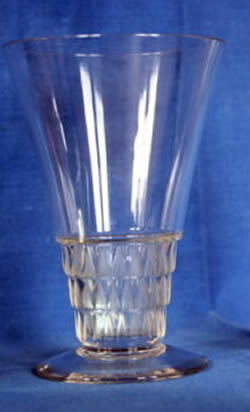 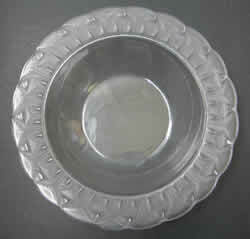 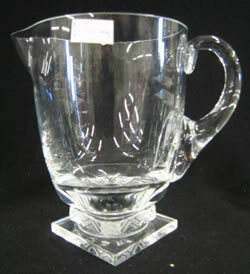 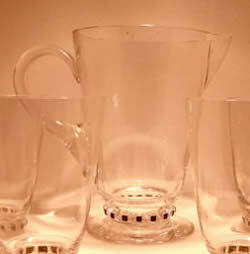 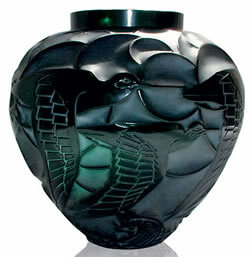 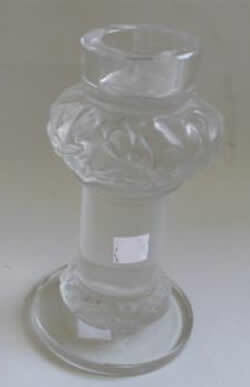 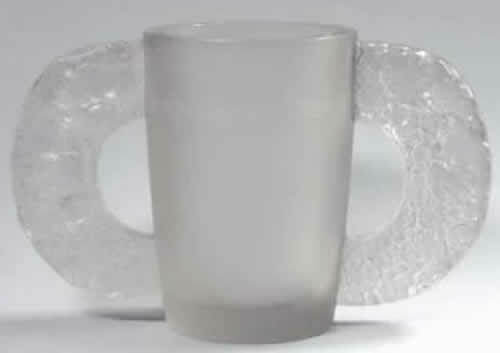 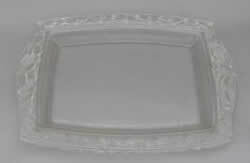 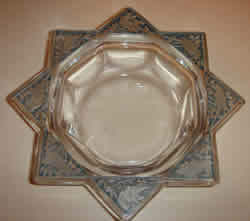 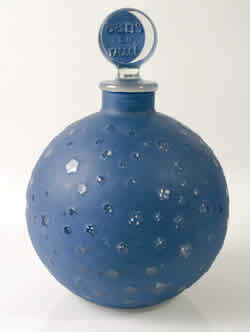 Other models types such as ashtrays and stemware reproductions are much less complete than the vases. 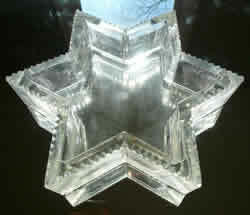 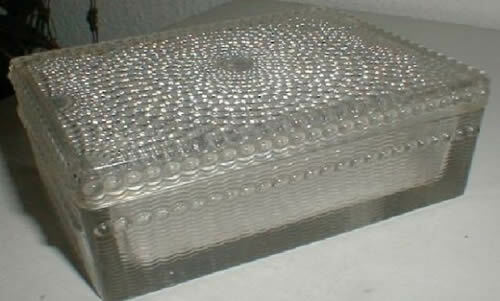 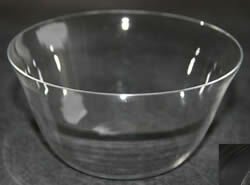 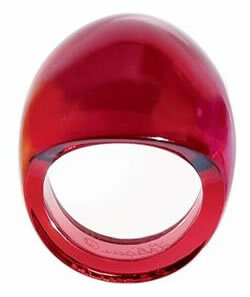 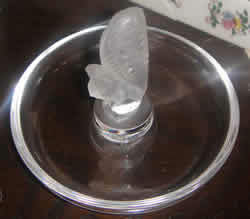 The fact that a photo does not appear here, does not mean that model has not been reproduced in crystal. 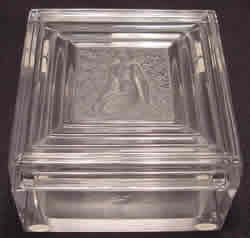 If you move your curser over any photo, the name of the model will appear.